The Age of Exploration led to the increasing popularity of the travel narrative, with accounts of voyages by Frenchmen to the Orient, to the New World, to Italy, and within France itself. André Thevet’s Cosmographie de Levant (Gordon 1554 .T54) represents the French fascination with the Orient, a destination for both pilgrims and traders. 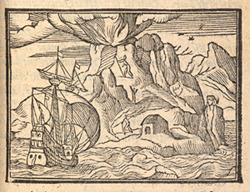 Thevet’s Singularitez de la France Antarctique (Gordon 1558 .T54) and Jean de Léry’s Histoire d'un voyage fait en la terre du Bresil (Gordon 1578 .L47) brought the New World to French readers of the Renaissance. 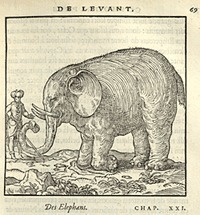 One of those readers, Michel de Montaigne, drew on the Thevet and Léry’s accounts of New World cannibals in writing his famous essay, "Des cannibales." The Gordon Collection also includes two volumes concerned with travel within France itself. The royal travels of Charles IX through France in 1564 and 1565 are recorded in Abel Jouan's Recueil et discours du voyage du roy Charles IX. de ce nom à, present regnant, : accompagné des choses dignes de memoire faictes en chacun endroit faisant son dit voyage en ses païs & prouinces de Champaigne, Bourgoigne, Daulphiné, Prouence, Languedoc, Gascoigne, Baiõne, & plusieurs autres lieux…. (Gordon 1567 .J68). For those who might want to undertake their own journey through the country, Charles Estienne published La guide des chemins de France, / reueue & augmentee pour la troisiesme fois. Les fleuues du royaume de France, aussi augmentez (Gordon 1553 .E78). This Gordon volume also includes Estienne's 1552 Voyages de plusieurs endroits de France: & encores de la terre Saincte, d’Espaigne, d’Italie, & autres pays.